It’s high time I post a recipe again! 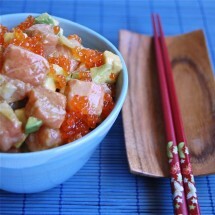 I have this wonderful Tuna’s tartare that I want to share with you. Don’t know if I’ll be back on the track again, but this is such a wonderful and fresh dish that I couln’t help it.This is so easy to prepare and so delicious to eat! You can even ask your kids to help you out in the kitchen. Now that spring and heat is coming back, this might be your option when thinking… I don’t feel like cooking, what could I do? The fruits vinaigrette combined with the tuna and the salmon roe will explode into your mouth with a delightful mixture of textures and savours. Trust me, this is soooo good!!! Thank you all for being there and enjoy the dish :D.If you rather have meat instead of fish, no worries, follow this link to get a wonderful steak tartare recipe! 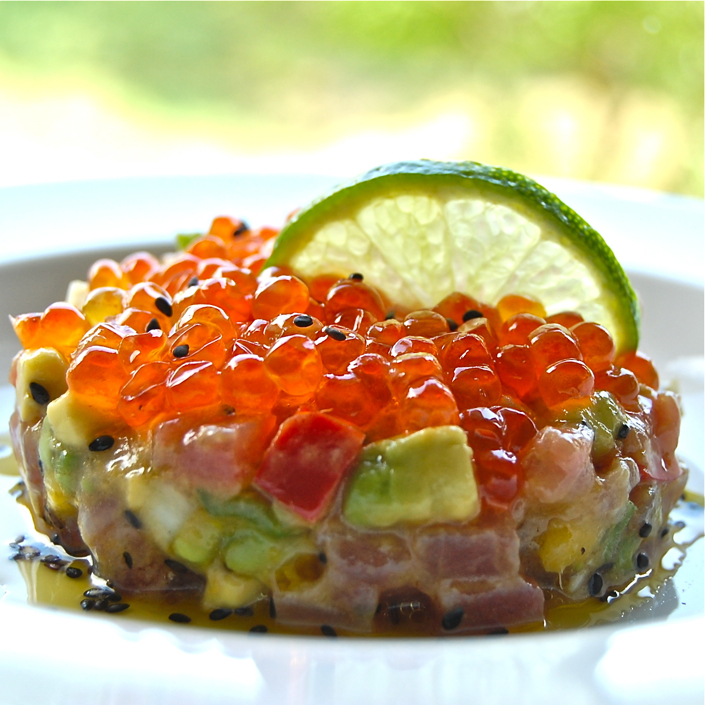 500 grs of fresh Tuna fish, 1 mango, 1 avocado, 1 fuji apple, 1 green pepper, 1 red pepper, 1 not too ripe tomatoe, 1 green onion, 2 teaspoons of dijon mustard, 1 spoon of honey, 1 lime, a 75 grs can of salmon roe, 2 teaspoons of black sesame seeds, extra virgin olive oil, apple vinegar and salt. Ask your fishmonger to cut the tuna in 2 or 3 pieces so that makes it easier to freeze and defrost. Also ask to get the skin removed. Once at home, wash it, dry it and freeze it. 24 hours will be enough to kill all anisakis. Defreeze the tuna inside the fridge. Meanwhile, peel and cut the mango, apple and avocado in small dices, reserve inside a big bowl and squeeze the lime over it. Take the seeds away and cut the peppers and the tomatoe in small dices too and add to the bowl. Cut the onion and stir the mixture. Add the mustard, the honey, 1 teaspoon of the sesame seeds, one small glass of vinegar and 2 1/2 of extra virgin olive oil and the salt. Add to the bowl and mix. Cut the tuna in dices too and add it to the vinaigrette. Mix all ingredients and keep in the fridge for 1 hour. 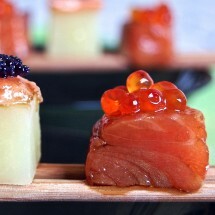 Present the dish making a timbale with a mold's help and crown it with the salmon roe and the rest of the sesame. Nuria, guapa! Te echaba de menos… me alegro un montón de volverte a ver por aquí, espero que todo te vaya bien y que este “intermedio” no tenga ninguna razón negativa. Un besote y preciosas fotos. Welcome back my friend. So much has happened since our last visit I am sure. Thanks for sharing this decadent treat, a snippet of your life in Spain. OMG Nuria or shall I call you Lazaro as if your blog has been resurrected again!! Welcome back my sweet friend. You were on my mind all this time and was thinking shall I send her an e-mail or shall I leave her in peace and chose the second option, hoping that the day would come that you would show up again. Hope to be seeing your wonderful recipes more often. Que sorpresa! I’m so glad I didn’t delete your blogger from my reader…I was hoping you would return one day! Thanks for being there! Don’t know if I’ll stay for long or not. Everything is fine, it’s just that I needed more time to do other things. LOVE YOU!